Kath was ‘grabbed’ by Simon and his wife to babysit Will, our lovely grandson, so I headed off to Luton again on my own to visit Dallow School. This was a first visit and would you believe I turned up a week earlier than expected. 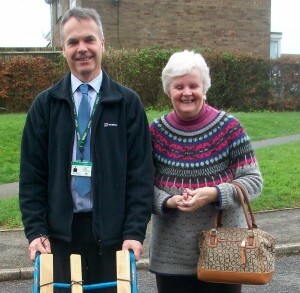 No problem…the lovely head teacher (Linda), had everything re-organised and sorted within minutes! What followed was truly brilliant! I thoroughly enjoyed performing the Bonebreaker presentation and managed to get through it without a hitch – even without Kath’s invaluable presence! Mrs Gustard-Brown (Mrs G-B as known to all) helped me every step of the way and I would like to thank her here in writing for being such a help and a great sport. (She even became victim to the Moonwailer werewolf and thankfully survived!) I thoroughly enjoyed my visit to Dallow Primary school and now include them as part of my Luton following. I’m already planning a return visit…so many more books to tell them about. visited close to Christmas and enjoyed the combination of Christmas lights and seaside promenade lights. Same again this time, though the lights of the famous Lanes looked even more striking. I performed my updated Mokee Joe presentation to a big KS2 audience and it went down a treat. Even Mr Cooper seemed engrossed, no doubt observing how much the presentation had grown and evolved over the last six years or so. And in the afternoon our workshop had Mr Cooper just as desperate as the Year 6’s to get his hands on the Ten O’ Clock Caller short story collection. Four Year 4’s also attended the workshop as a treat for creating a great Mokee Joe film which we were privileged to see…really gripping and an indication of how fabulous it would be to one day having the real thing, a super-scary Mokee Joemovie. won’t be such a long wait. In fact we’re planning to return to Mile Oak Primary in June after our new football-themed book has been released – KRUSCHMEISTER. Whilst we were in Brighton we met up with good friends from our days at Cheam School – the talented (and much younger than me) children’s author, Luke Temple, and his mum, Barbara. It was magical wandering around the Lanes with them and enjoying a coffee and a cake in the quaintest of coffee bars. Love to them both and to Mike, Luke’s dad, who couldn’t be there due to ill health – we wish him a speedy recovery. Next port of call…Essex and Southend! Seems we can’t avoid the seaside at this grey, grim time of year. It’s a good job we get such a warm and bright reception in the schools. Bring it on! 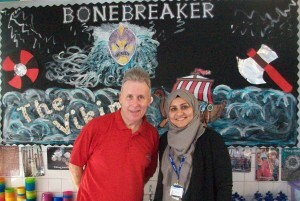 Kath and I have just spent an entire week working in one school – Beech Hill Primary School in Luton. This school has a reading culture like you wouldn’t believe. The staff and pupils treat it as completely ‘normal’ to allow their lives to revolve around books, which makes their school environment a total paradise for an author like me! Working at the same school every day was almost like being a teacher again, except that maths was no longer on my agenda! We worked with Years 5 and 6, eight classes in total, all totally devoted to my books, especially Mokee Joe and Bonebreaker. Our good friend and Deputy Head, Mr Gary Hawkins, ensured that everything went smoothly and he even timetabled in a few ‘special’ sessions, working with Year 7’s and 8’s from the nearby Denbigh High School – a huge success thanks to the enthusiasm of the 18 boys and three teachers who took part. We did our short spooky story workshop with them over two sessions and by the end of it they were desperate to read the Ten O’ Clock Caller compilation and write spooky stories of their own. We heard that one of the boys had written his story within three hours of returning to his school. Brilliant! 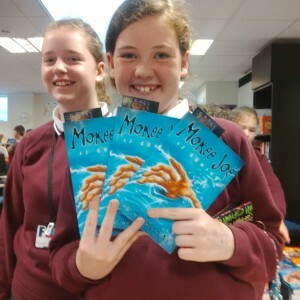 good friend from this school, Mrs Linda Carey, ensured that the end-of-the-week book signings went smoothly and that all children got the few signed books that they hadn’t already got. Around mid-week another author turned up at the school to carry out some amazing art workshops. The author is known to us just a little – our son and Icky Doo Dah author, Simon Murray. 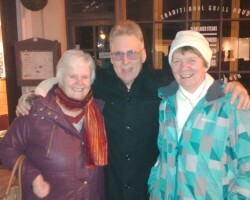 Seriously, it was lovely to have him around and of course, Mum and Mrs Carey made a great fuss over him. 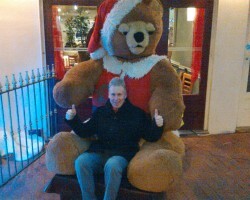 Lucky old Simon! All in all a FABULOUS week at this FABULOUS school -the entire staff and pupils without exception pull together as a great team and for one week each year Kath and I are privileged to be part of it. See you all next year with my new football book – KRUSCHMEISTER – can’t wait! This post was written by peterjmurray on November 8th, 2015 10:55 am Comments Off on NORTH EASTERLY MAGIC! Kath and I love going up to the North East. Apart from the fact that her brother lives up there in Ponteland (on the posh Darras Hall Estate), the schools in the area are all fab and know us and our books extremely well. Our great friend, Jon Roys, was waiting to greet us at the huge Valley Gardens MS. Jon and I are both from Rotherham and he likes to remind me that I taught him many years ago when I was an aspiring maths teacher! We performed our updated Mokee Joe presentation to a big Year 5 and 6 audience and it went down a storm. This is the school were a certain pupil called Adam came up on stage some years ago and revealed to all the fact that he didn’t have a belly button (as with the hero Hudson in the Mokee Joe series). We still haven’t got over it…and probably never will! If you’re reading this, Adam, hope you’re well and good luck with everything! Next day we crossed over the A1 to stay with Kath’s brother in Ponteland before visiting our old friends at the Richard Coates MS. We love this school and it’s always a pleasure to present to the more-than-enthusiastic pupils and staff. Mrs Roys (Jon’s wife) looked after us and the Year 5’s and 6’s proved to be another big and receptive audience. We signed more books than you would believe at both schools and my right hand is still suffering from repetitive strain injury. I can hardly type this blog!! The lovely pic of Summer (with THREE book 1’s) and her friend, Ruby, gives some indication of how busy the signings were! 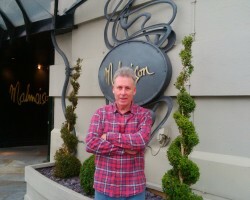 Pete's head blocking out the Malmaison sign! more of a shame one of the lovely pupils was really hurt trapping his fingers in a fire-door…OUCH! 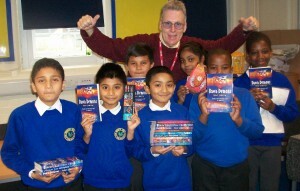 But James still turned up to receive his Mokee Joe book given to him to cheer him up by the kind pupils and staff. I even signed his sling and drew a smiley face on it. James…if you’re reading this – well done for being so brave! Our last night was spent at the Malmaison Hotel on the Newcastle Quayside – a real treat. Unlike 1-direction, we didn’t trash our room before we left! Oh well, just a little breather at home and then off away to Luton to work all week in one of our fave schools – Beech Hill Primary. See you all soon.